Analysis of 2013-2014 LessWrong survey results on how much more self-identified EAers donate suggests low median donation rates due to current youth and low incomes. A LW critic noted that the annual LW survey reported a median donation for “effective altruists” of $0, though the EA movement encourages strongly donations. 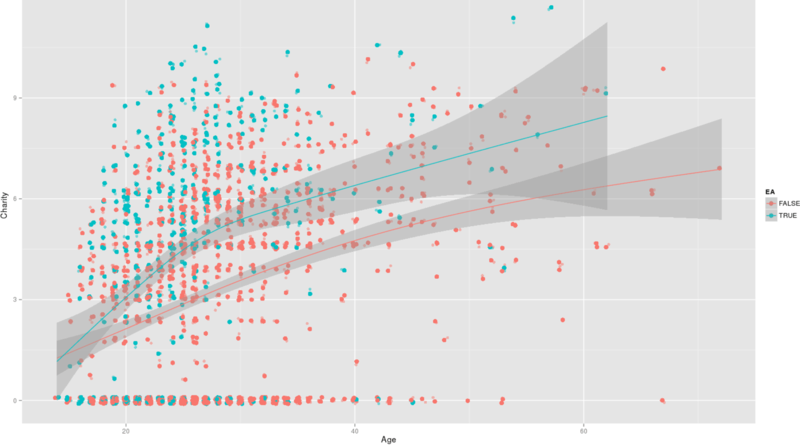 I look closer at the 2013-2014 LW surveys and find in multiple regression that identifying as an EA does predict more donations after controlling for age and income, suggesting that the low EA median donation may be due to EAers having low income and youth (eg being a student) rather than being unusually or even averagely selfish. But I note from googling for surveys that the median charitable donation for an EA in the Less Wrong survey was 0. Two years ago I got a paying residency, and since then I’ve been donating 10% of my salary, which works out to about $5,000 a year. In two years I’ll graduate residency, start making doctor money, and then I hope to be able to donate maybe eventually as much as $25,000 - $50,000 per year. But if you’d caught me five years ago, I would have been one of those people who wrote a lot about it and was very excited about it but put down $0 in donations on the survey. The LW survey run by Yvain has, in the 2013 and 2014 surveys (but not previously), asked one or two questions about whether respondents self-identify as Effective Altruists and also how much they have donated that year to charity. The surveys also ask if one has responded to a previous survey, and ask about various things that might plausibly predict donations: employment status, profession, educational attainment, age, and of course, income. # appropriately, and the GAM/loess wiggly-but-increasing line seems like a better summary. # So I will treat Age as a linear/additive sort of thing. # a latent variable in a SEM; then we use EA plus the other covariates to estimate the CharityLog. Note these increases are on a log-dollars scale. In all the analyses, median donations are >$0, and EAers report donating more. 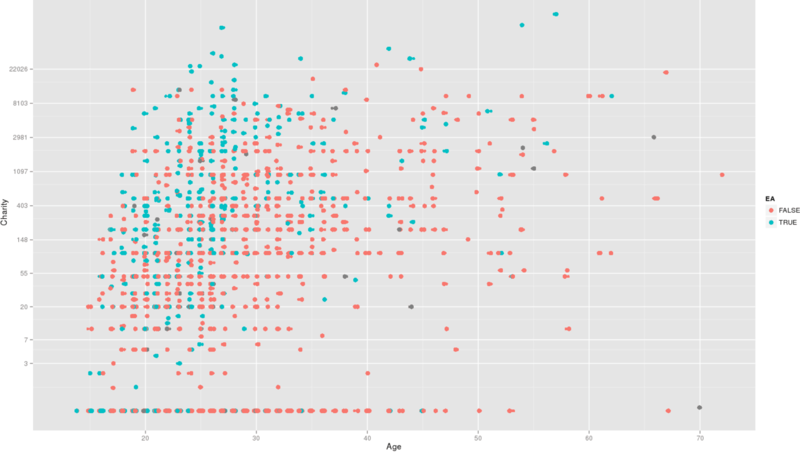 There is also Yvain’s predicted correlation of age with donation amount.